A small town in Alabama is offering non-violent offenders the choice between doing prison time and paying a fine, or working their sentence off by going to church every week. The city judge of Bay Minette will give offenders the choice beginning Tuesday, as part of Operation Restore Our Community or "ROC," according to WKRG News. If someone goes for the church option, they have to attend every Sunday for a year and check in weekly with the pastor and the police department before their case can be dismissed. 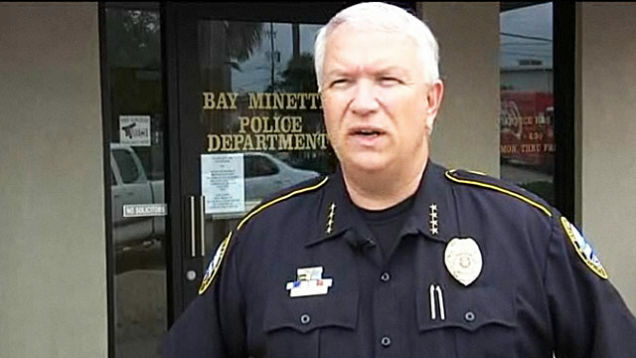 Bay Minette Police Chief Mike Rowland (pictured above) said the program would save the town the $75 a day it costs to house an inmate. And, he said, "it was agreed by all the pastors that at the core of the crime problem was the erosion of family values and morals. We have children raising children and parents not instilling values in young people." "You show me somebody who falls in love with Jesus, and I'll show you a person who won't be a problem to society," he told WKRG. "This policy is blatantly unconstitutional," Olivia Turner, executive director of the ACLU in Alabama, told the Alabama Press-Register. "It violates one basic tenet of the Constitution, namely that government can't force participation in religious activity." Rowland responded that the policy doesn't violate the separation of church and state because the offender can choose whichever church he wants. Rowland also noted that non-Christians can choose their own place of worship, though the Press-Register pointed out that no mosques or synagogues are participating in the program because there are none in the area. "When the alternative to going to church is going to jail, the so-called 'choice' available to offenders is no choice at all," Rowland told the Press-Register. Republished with permission from TalkingPointsMemo.com. Authored by Jillian Rayfield. Photo of Chief Rowland via WKRG. TPM provides breaking news, investigative reporting and smart analysis of politics.